Playwright Eugene O’Hare's new play Hospital Food was specifically written for young people to perform as part of 2015’s National Theatre Connections. Connections began 20 years ago when teachers and directors told the National Theatre that they wanted exciting and challenging new plays for young actors. Since then the NT has commissioned and published more than 140 plays for Connections, giving young people aged 13-19 across the UK and Ireland access to the very best new writing for theatre. 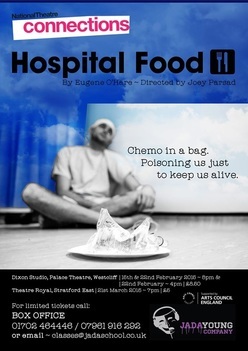 Hospital Food, which runs as a 50 minute One Act play, introduces us to ten young cancer patients all receiving conventional treatments for their differing cancers whilst all at different stages of progression. There is one place that they can all meet without the intrusion of the prying, over concerned eyes and ears of adults, doctors and nurses, a place where they can discuss their illness, their thoughts and fears and know that whatever is said there will stay there. This special room they name The Retreat. I’m not going to lie, the thought of seeing a play that is set within a teenage cancer unit, didn’t exactly fill me with eager anticipation. Why would it, right? A play about teenagers with cancer isn’t exactly going to be a barrel of laughs, right? Well…wrong, actually. Playwright, Eugene O’Hare, cleverly intersperses his brand new script with some fabulous humorous dialogue. The JADA Young Company brought his words to life with some outstanding performances, particularly from Jacob Davies-Giles as Gus, whose mother has decided that holistic treatment in another country is his only hope of survival and this plan of action he confides to the others in The Retreat. Danny Whitelaw who plays Josh, Gus’s best “tied at the hip” friend also stands out. They both share a very touching scene where the true sense of their friendship is brought to light. Megan Walker as the feisty Layna also gave a confident portrayal of her character, who wants to blow the whistle on Gus. She loves him and believes that he should stay at the hospital and continue with the conventional treatment that they are all having. Should she betray Gus and the secret he has revealed in The Retreat by telling the doctors about what only him and his mother know? This really is the essence of what the play is about. It’s not so much a play about cancer as a play about whether one should betray for love. It’s not about being able to stay alive but to be able to live a good life. “I don’t want to be alive, I want to live.” Gus tells Josh. Each youngster has a heartfelt story and I felt especially moved by Sadie’s tale of her pet dog, told beautifully with a very natural performance from Mari Beaseley. The laughs of the evening came from the young Callum Popham as the cheeky, yet naive, Reece and a great scene involving him, Elliot Stavrinou as Joe, Maddie Stavrinou as Karis and Will Caustin as Cain which involved a bit of a misunderstanding with a postcard. I won’t say any more, as I don’t want to give the game away. This play has a very strong cast who all worked brilliantly as an ensemble. I loved the use of physical theatre within certain scenes and the music pieces were perfectly chosen. Lighting played a major importance to this piece, being set on a bare minimalistic performing space and actors had to quite literally hit the spot or the whole effect would be spoilt. Sam Thomas did a first class job and should congratulate himself and the actors for hitting their marks perfectly. Joey Parsad has done a fantastic job with this script and I love how she has interpreted O’Hare’s work with lots of originality. Once again, she should be very proud of her achievements with this company. So, in retrospect, I would say don’t be put off seeing this play regardless of whether or not its subject matter makes you feel a little uneasy. Go and see what amazing young talent Southend has to offer but more importantly, make sure you go and buy some tissues - because the likelihood is that you’re probably going to need them before the night is through.